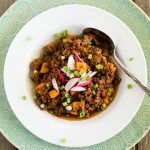 Spicy homemade chili recipe with the sweetness of sweet potatoes and the spice of chipotle peppers! Stir well and bring up to a boil then simmer, covered, stirring occasionally, for about 45 minutes or until the sweet potatoes are soft. Adjust the seasoning, if desired, and serve immediately.